A hand illustrating how questionable preflop decisions can compound difficulties on later streets. 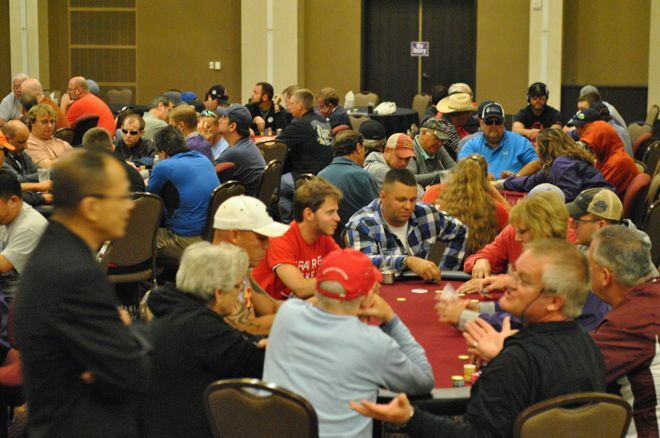 Mo Nuwwarah reviews a Mid-States Poker Tour Main Event hand he wishes he'd played differently. About a month ago, I had the chance to drive a short few hours north of Omaha (where I live) to play the Mid-States Poker Tour Grand Falls $1,100 Main Event just outside of Sioux Falls, South Dakota. There I wound up putting in three bullets and running up decent stacks every time only to fail to make Day 2. While it was very frustrating, at least I got some hands to write about out of the experience. This week and next week, we'll go over a couple of the regrettable ones that left me shaking my head and shorter on chips. For this first one, the opener was a player who seemed very inexperienced, as he had little concept of sizing bets either preflop of postflop. For example, I'd seen him make very large raises in the vicinity of ten times the big blind and then show big pairs when he didn't get action. He was running very hot, though, and covered my stack of 90,000 or so. With blinds at 600/1,200/200, this player raised to 8,000 from under the gun. I was dealt and called from the button, and both blinds folded. The flop came and my opponent continued for 8,000 more. I called. The turn was the and he once again bet 8,000. Again, I called. On the river, he checked. I bet 15,500 and he snap-called, showing in a hurry and taking it down with the rivered top pair. Ordinarily, calling huge raises with from players who aren't opening light isn't something I'm looking to do. However, playing about 75 big blinds deep, having the button, and feeling as though I didn't want to continue to fold to these opens, I decided it wasn't a horrible spot to try to mix things up a bit. Particularly given his earlier sizings with nutted hands, I figured he most likely had a big ace and I could win the pot fairly often if we both missed. When the flop came connected as it did, I figured this was going to be the perfect opportunity to execute my plan and float. So I called the flop without much of anything besides a backdoor nut flush draw while hoping for another scare card on the turn. I got exactly what I hoped for when the fell and more, as I actually had a number of outs to the nuts plus nines would give me a very likely winner. Now, my opponent bet very small, using the same sizing he had preflop and on the flop. Anecdotally, over the course of hundreds of thousands of hands, many of them played against inexperienced players like this, history tells me this line is not usually a strong hand. It could be different in this particular spot, but instincts in my head were telling me I was up against ace-queen or ace-king. Still, I thought, it could still be a big pair. Perhaps he doesn't want to give up the betting lead and feels uncomfortable check-calling a big pair here. My first instinct was to put in a big raise and commit myself. If the worst case unfolded and he had aces and wouldn't let them go, I still had decent equity. If I was right, I'd win a good-sized pot right there. Then, I thought, why not just peel another one off? If he has a big pair, I get a cheap opportunity to get there. If he doesn't, I can probably just win by bluffing the river. So that's what I did, and that ugly offsuit queen peeled off the deck. My opponent checked and I figured I better take a stab and see if he had ace-king. I considered betting large, but inexperienced players will often overvalue big pairs here and just call no matter what, so I figured a smaller bet would do the trick and win the pot against ace-king while saving some ammo in case my read was off. As it turned out, he had the ace-queen and paired up. Obviously, it was a brutal river for me as I'd have won the pot with likely almost anything but an offsuit queen. Still, I couldn't help but think back to my turn decision. If I had just gone with my read and jammed holding all of those outs to the nuts, I'd have been really cooking with a stack of around 100 big blinds. This hand also shows how questionable preflop decisions can really compound things later in the hand. Just folding preflop and waiting until this player stopped picking up monster hands would have left me in a pretty great position as well, one I wasted by trying to get a little too cute.